This classic potato salad is easy to make (with an Instant Pot option for cooking the potatoes), tastes great, and has been a family favourite for years! 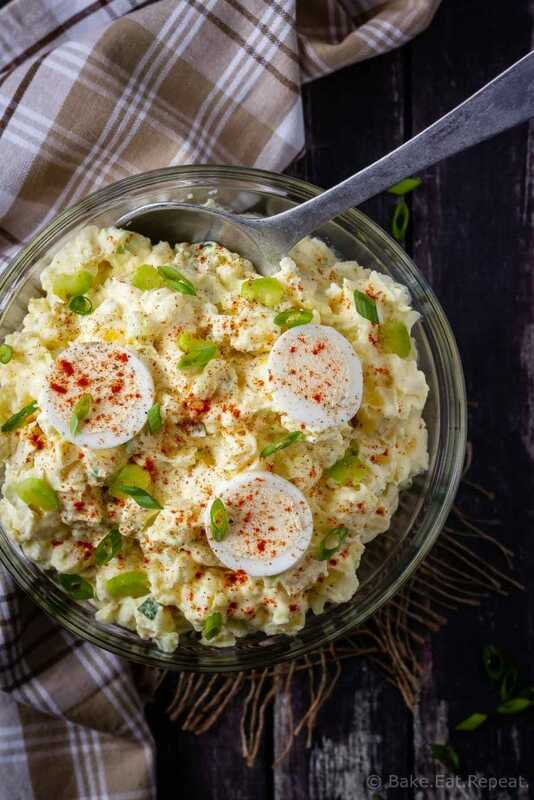 This potato salad recipe is the best potato salad recipe ever. I’m just going to throw that out there. Feel free to email me and tell me that I’m wrong and your potato salad recipe is the best. I think a lot of people have their favourite version of this classic summer salad. You won’t change my mind though – this one is the best. Although I’m willing to admit that some other versions may be tasty too! But I haven’t yet met the person that didn’t love this potato salad when they tried it. Pretty sure that makes it the best. My entire family has been making this potato salad recipe for years and years and years. My grandma made it, my mom makes it, all my aunts and I’m sure most of my cousins make it. And before you ask, that’s actually a lot of people because my family is enormous. A family reunion for us is not a small event. 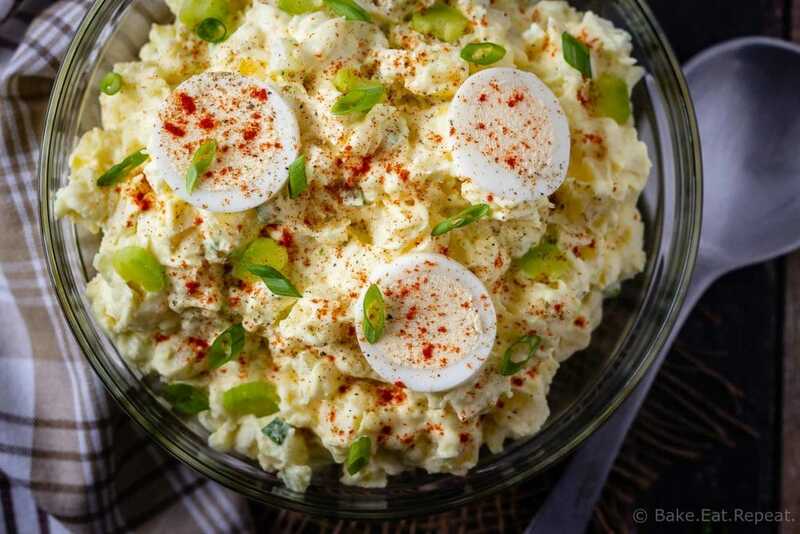 This potato salad (or rather about 6 recipes of it) generally makes an appearance at those events – we all love it. And if you have an Instant Pot you can even make it without having to boil potatoes and eggs – which for some reason I really hate to do. Neither of those ever cook the exact right amount for me when I boil them – I forget about them, I take them out before they’re done, the pot boils over because I start doing something else….there’s always something that makes it a pain. So I’m loving the Instant Pot for these tasks! Instant Pot hard boiled eggs take just 4 minutes to cook perfectly. Cooking potatoes in the Instant Pot for potato salad takes just 3 minutes – and your potatoes will be cooked perfectly – not overdone and mashing when you try to dice them. Now that there’s no boiling needed for this recipe, it will probably get made way too often around here. 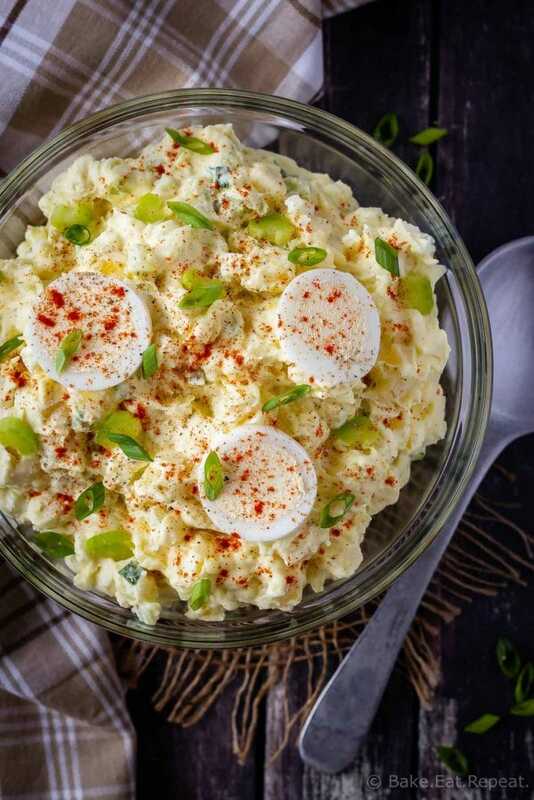 Because it’s the best potato salad, and the perfect summer side dish! If you want to lighten up this potato salad a bit, you can replace up to half of the mayonnaise with plain Greek yogurt. This does add some tanginess to the salad though, so keep that in mind before making that change. I’ve replaced a quarter of the mayo with Greek yogurt without any noticeable difference in taste though. You can also use light mayo without any noticeable taste difference. Make sure to dice the potatoes (I usually use russet or yellow potatoes) while they’re warm and toss them with the marinade – they need to cool while being marinated. Plan ahead, because there is some chilling time necessary for this salad – the potatoes need to marinate until cold, and then the salad is mixed together, then the entire salad needs to chill for at least two hours before serving. 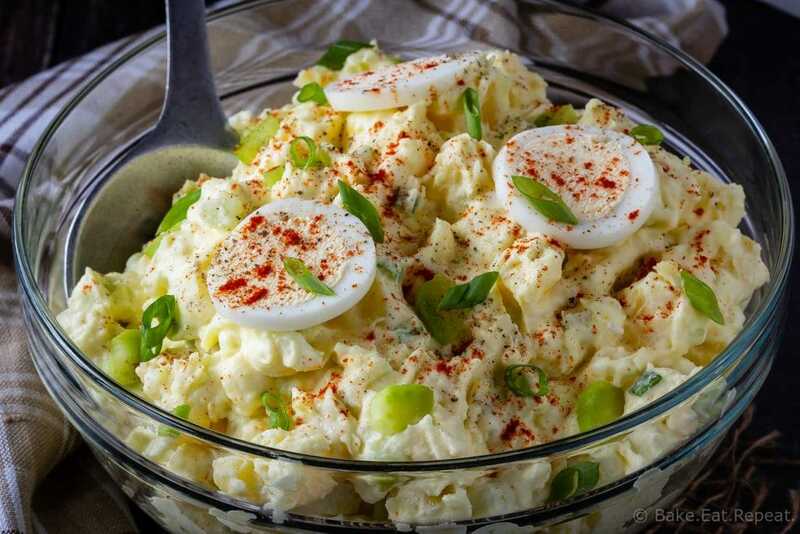 This potato salad recipe can easily be increased if you need to feed a crowd. Cook the potatoes - you can either quarter the potatoes, place them in a pot and cover them with cold water, then bring the water to a boil and cook them for 15-20 minutes, or until they’re tender when pierced with a fork, but not falling apart. You don’t want them so soft that they mash when mixing them into the salad. You can also cook the potatoes in the Instant Pot. Put the peeled, whole potatoes in the bottom of the Instant Pot with 2 cups of water. Lock the lid and make sure the valve is in the sealing position. Cook on high pressure for 3 minutes. When the cook time is finished, quick release the pressure and carefully move the cooked potatoes to a cutting board. Dice the potatoes evenly (about 1/2 inch cubes) while they are warm. Whisk together the olive oil, vinegar, lemon juice, mustard, sugar, salt and tabasco sauce in a large bowl and toss the potatoes in the marinade. Refrigerate until cold, about 1-2 hours. Once the marinated potatoes are cold, add the eggs, celery, green onions, pepper and mayonnaise. Stir gently to combine everything. Chill the salad for at least one hour, and sprinkle with paprika before serving. The "cook time" listed is chill time for this recipe. I LOVE this recipe. My mother always added olive oil to the cooked potatoes just to keep them moist, and then continued with the recipe. You've done the same thing, basically, but used the actual vinaigrette. Great ingredients.